#17. 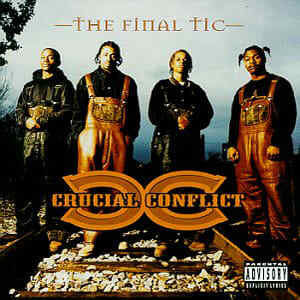 Crucial Conflict f/ Toi "Ride the Rodeo"
"Cold Hard, Never, Wild, Kilo finna bring it on, giddy up..." You thought Cru Con could only make records about pimpin' and gangbangin'? Well, think again. "Rodeo," the 'Flict's feel-good party-starter, was the perfect follow-up to their debut smash hit "Hay," which thrusted them into the public spotlight. This fearless foursome from the wild, wild Westside of Chicago, who were discovered by Fab 5 Freddy, may have been typecast as cowboys, but best believe there was nothing country about them.